Black Flowers got me thinking about polyphonics (multiple voices), with each of the flower stems stretching vertically like an individual voice raising to the sky in song. While polyphonic texture extends to ancient and sacred music from all over the world, it may be found in any composition with overlapping melodies in counterpoint. 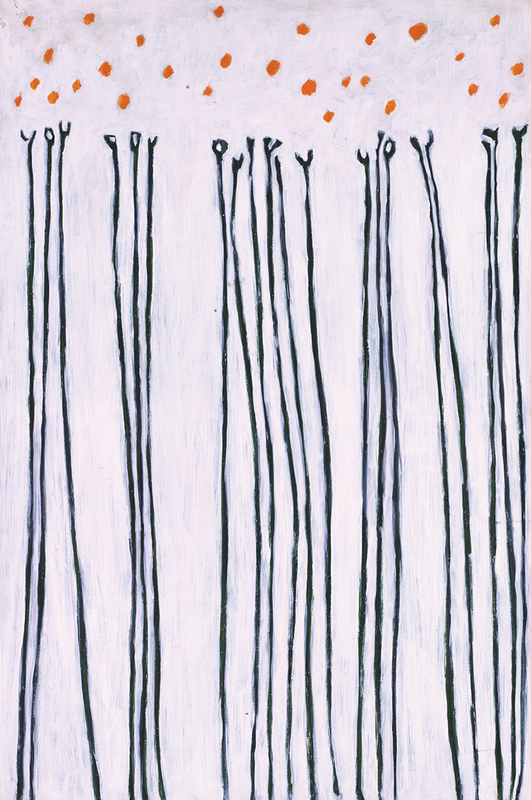 The “voices” in a polyphonic piece can either be sung by a single voice in overlapping recordings (like Mouth’s Cradle), multiple voices (a whopping 40 voices appear in Spem in Alium) or played on instruments (such as Fables of Faubus); or in this case, painted into the long, slender stems of Gene Davis’s black flowers to create a tension and rising movement evocative of the songs on this list.